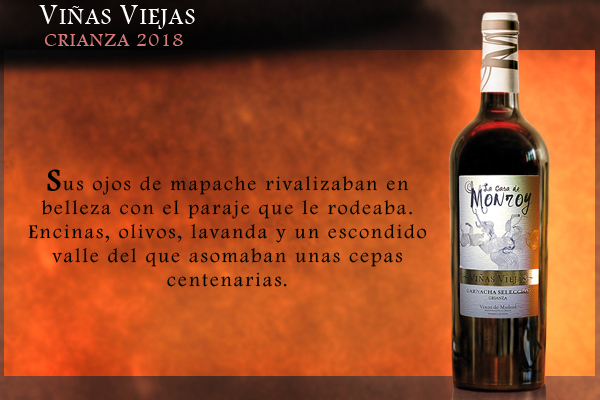 Grape Varieties: 90% garnacha from our oldest vineyards (more than 80 years old), 5% Syrah and 5% Tempranillo (El Repiso). Climate: continental mediterranean climate under the influence of Alberche River Valley and the Sistema Central range. Viticulture: head training grapetrees grown in rainfed over sandy, poor and siliceous soils. The average yield is less than 2.000 Kg/Ha. Elaboration: soaking process with postfermentative maceration. Alcoholic fermentation at low temperature and malolactic fermentation at controlled conditions. Ageing: 12 months in French oak barrels of 225 liters. Food macht: pairs perfectly with beef stews, hotpots, oxtail, legumes, strong cheese and grilled meat. Service Temperature: 15º-16º C. Decant 20 min. before serving. Production: 5.400 numbered bottles of 0,75 L.